Accomplished Southern Nevada junior golfers Milan Norton and Yana Wilson are trying to match the Drive, Chip and Putt national championships of fellow local golfers Morgan Goldstein and Hunter Pate. 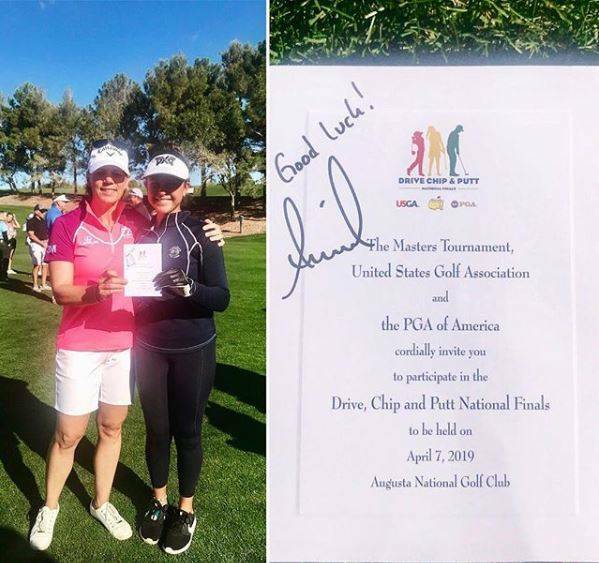 Yana Wilson was recognized for qualifying for the Drive, Chip and Putt finals by LPGA Tour hall of famer Annika Sorenstam during a golf clinic at Southern Highlands. The finals are April 7 at Augusta National as part of the Masters. Photo courtesy Wilson family. 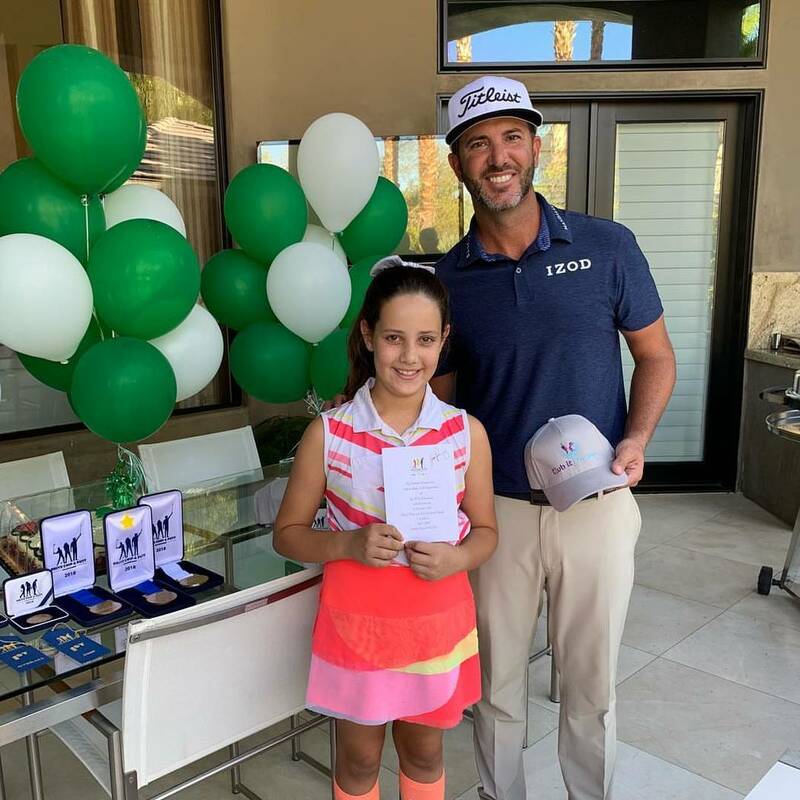 Milan Norton received her official Drive, Chip and Putt invitation to Augusta National as part of the Masters from Las Vegas PGA Tour player Scott Piercy. Photo courtesy Norton family. Accomplished Southern Nevada junior golfers Milan Norton and Yana Wilson are trying to match the Drive, Chip and Putt national championships of fellow local golfers Morgan Goldstein (2015) and Hunter Pate (2014). The annual competition is Sunday and held in conjunction with The Masters at Augusta National in Georgia. Norton, a 9-year-old Faith Lutheran student, and Wilson, a 12-year-old Henderson resident, survived local and regional qualifiers to earn spots in the competition that will be televised on Golf Channel. The Masters begins Thursday, April 11. 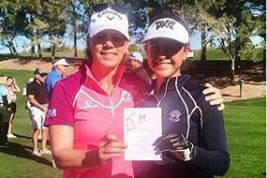 Norton received her official invite from PGA Tour player Scott Piercy while Wilson was recognized by Annika Sorenstam during a golf clinic at Southern Highlands. Both youngsters are active on social media and Wilson shared information about Youth on Course, an organization that allows juniors to play golf for cheap rates. Local juniors can receive the benefits at area courses by joining the Southern Nevada Junior Golf Association at SoutherNevadaJuniorGolf.com. Since 2014, a select field of juniors from around America have taken swings in the Drive, Chip and Putt event, which is a collaboration of the PGA of America, United States Golf Association and the Masters. The competition’s mission is to help promote golf and grow the sport. Any junior has an opportunity to earn a spot in the prestigious competition. The local qualifier for the 2020 Drive, Chip and Putt competition is May 29 at TPC Las Vegas. All info: drivechipandputt.com. Hollis Barnhart, a UNLV men’s golf team member from 1970 to 1974 when the late Chub Drakulich was the coach, presented current coach Dwaine Knight with three vintage MacGregor Silver Scot persimmon woods last week during a meeting, which included assistant coach Philip Rowe. Barnhart was given the clubs 50 years ago by Tommy Armour III following a match at Las Vegas Country Club. Armour III, a two-time PGA Tour champion, now plays on the PGA Tour Champions and is the grandson of Tommy “the Silver Scot” Armour, the namesake of the clubs. Armour III played for Knight at the University of New Mexico. Joe Kelly, a longtime PGA of America professional and 2010 Las Vegas Golf Hall of Fame inductee, is the organization’s new president. Kelly announced that Las Vegas Golf Hall of Fame weekend is Sept. 27-28 and will feature a tournament at Spanish Trail and night of induction at the Hill at TPC Summerlin. The events kick off Shriners Hospitals for Children Open week. Nine-hole rates are $29 for locals at Las Vegas National before 8 a.m.
Hall of Fame baseball pitcher Rollie Fingers played Bali Hai on Monday during the Major League Baseball players alumni tournament. When: Thursday-Friday, 1-4 p.m. (Golf Channel); Saturday, 10 a.m.-12:30 p.m. (Golf Channel), noon-3 p.m. (KSNV-3): Sunday, 10-11:30 a.m. (Golf Channel), 11:30 a.m.-3 p.m. (KSNV-3). Where: San Antonio; TPC San Antonio (AT&T Oaks) (7,435 yards, par 72). When: Thursday-Friday, 9 a.m.-1 p.m., 4-6 p.m. (Golf Channel); Saturday-Sunday, 2-6 p.m. (Golf Channel). Where: Rancho Mirage, California; Mission Hills CC (Dinah Shore Tournament) (6,763 yards, par 72).